The average adult loses about 100 hairs a day, but since we have somewhere between 100,000 and 150,000 hairs on our head we don't really miss it. However some of us do lose more hair than we should and are left with thinning, balding patches and hair that won't grow very long. 10 million men and 8 million women suffer from hair loss, but just because it's common doesn't make it any easier to accept when it happens to us. 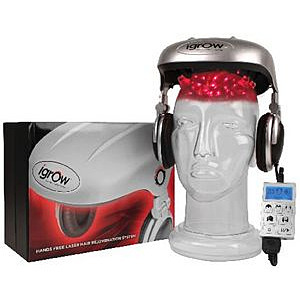 Brand new to StressNoMore is the iGrow Laser Hair Rejuvenation System. Designed for both men and women with hair thinning and hair loss, the iGrow uses a revolutionary combination of LED and lasers to give Low Level Light Therapy (LLLT) to stimulate the regrowth of thinning hair.